Boeing Charges Bombardier with ‘Dumping’ C Series into U.S.
Boeing has filed a complaint with the International Trade Commission charging Canada’s Bombardier with “dumping” its C Series narrowbody airliner at below cost into the U.S. The charges stem from the 2016 sale of 75 CS100s to Delta Air Lines. In its complaint, the U.S. company claims Bombardier sold the airplanes for $19.6 million each, or some $13.8 million less than they cost to manufacture. Bombardier has announced plans to boost C Series production from seven airplanes in 2016 to between 90 and 120 airplanes by 2020. Bombardier disputes the figures cited by Boeing, calling the allegations "absurd." "Boeing's number is materially wrong--it is off by millions," said Bombardier in a written statement. "We are confident that the government investments and our commercial activities comply with the laws and regulations in the jurisdictions where we do business." In its petition, a footnote referencing Boeing's claims regarding the cost of the C Series refers to Delta's first- and second-quarter 2016 10Q reports with the Securities and Exchange Commission, and Bombardier's first quarter 2016 report, which cites a $500 million "onerous cost provision" associated with C Series sales to Delta, Air Canada and Air Baltic. 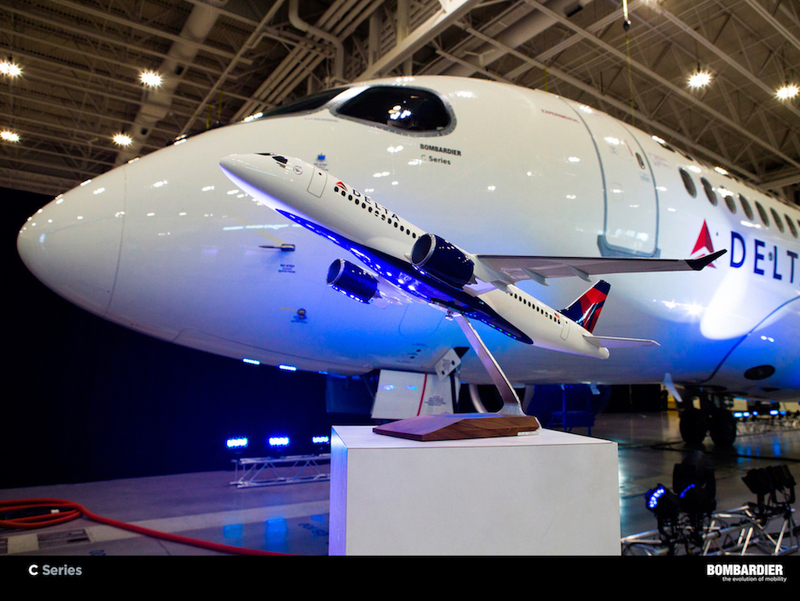 The contract with Delta includes options for an additional 50 aircraft, and the airline may elect to convert a portion of its commitment to orders for the larger CS300. The Atlanta-based carrier will serve as the U.S. launch airline of the 110-seat CS100 as well as Bombardier’s largest C Series customer. Delta expects to start taking deliveries next spring. Boeing had offered Delta the 737 Max 7, a re-engined derivate of the 737-700 that competes directly with the C Series. The U.S. company estimates that the C Series has received government support totaling more than $3 billion. Delta’s order came six months after the province of Quebec agreed to infuse $1 billion in the financially strapped C Series program, giving it a 49.5-percent stake in a limited partnership with Bombardier. Less than a year later the Canadian federal government agreed to grant Bombardier C$372.5 million in interest-free loans for both the C Series and the Global 7000 business jet. In February the government of Brazil formally asked for consultations with the Canadian government at the World Trade Organization in Geneva over public support for the C Series. The smaller of the C Series jets competes with coming E195-E2 built by Brazil’s Embraer. Brazil claims that Bombardier received more than $2.5 billion in illegal government support last year alone and some $4 million over the life of the program. The request for consultations marks the first stage of the dispute settlement procedure and allows Brazil access to additional information on the support given to Bombardier.